Thermal barrier technology (also known as thermal break) is a turn-key solution to optimize thermal performance for manufacturers of aluminum commercial window, door, storefront, and curtain wall materials. More widely referred to as the pour and debridge method, the structural polymer thermal barrier lowers U-factors to improve energy savings in the window assembly. 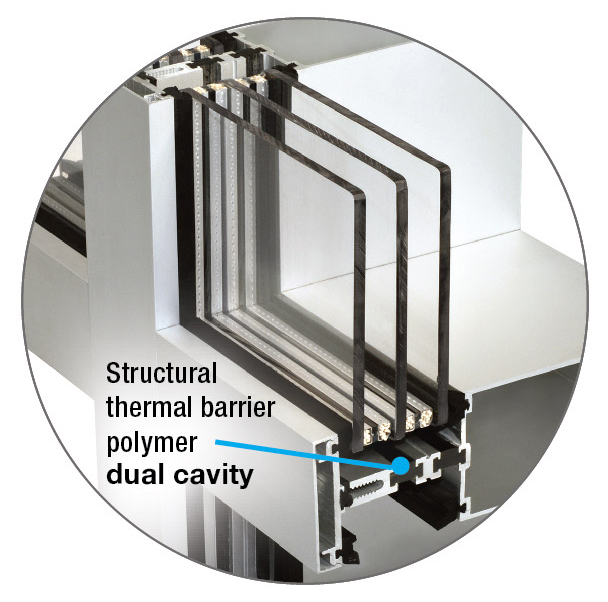 Double pour and debridge thermal barriers utilize two cavities and mechanical locks or surface conditioning prior to pouring to offer the best combination of energy efficiency and a high shear strength for aluminum fenestration products used in some of the most demanding climates and conditions. Safety and security: Energy-efficient blast and hurricane resistant aluminum storefront and architectural window systems are available from several manufacturers using the pour and debridge thermal barriers system. Recent breakthroughs: An emerging thermal barrier system for aluminum framing developed to cope with extreme weather conditions and acoustic performance features a high-density polyurethane foam core. The thermal and sound attenuating improvements of the foam core—when glazing infill is also high performance—contribute to energy efficiency of a building to meet stringent global energy standards, including Passive House and International Energy Conservation Code (IECC) and Sound Transmission Class (STC) ratings. As the demand for new and different design elements in the Canadian construction market continues to grow, digital printing on architectural glass is one element that can be ideal for adding a distinctive touch to projects. The smoothest path to net zero is through passive building certification, because a passive building is a complete system with quality assurance built into the system, rather than a collection of discrete programs. The most common passive building certification in North America is PHIUS+. Barrier-free, accessible, universal, and inclusive design are all terms used to describe the same thing: a design that creates a built environment usable by everyone. Minimum barrier-free design requirements are derived from the provincial and national building codes. There is perhaps no building element that typifies contemporary architecture more than the curtain wall. Lightweight and flexible, these glazed assemblies not only allow more usable floor space within a building, but also epitomize upscale, modern construction.